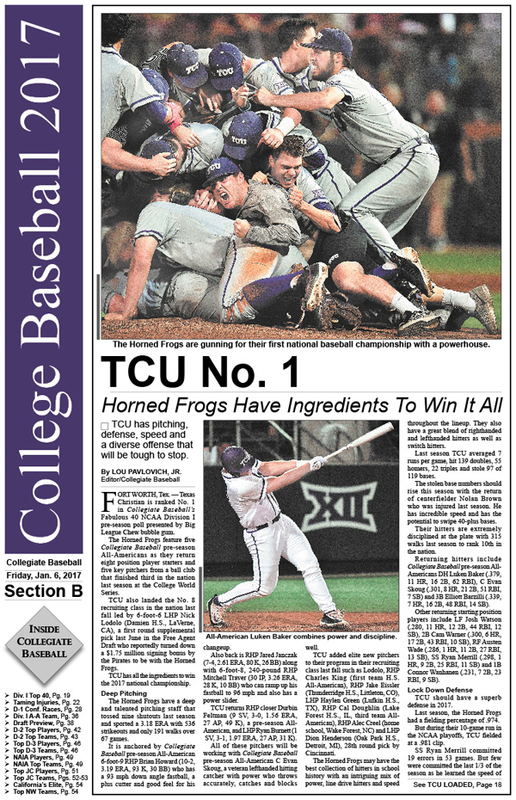 • Special 2017 College Preview Section: CB takes a look at all the top teams as well as players on every level of college baseball in 40-page section. • NCAA Div. I Conference Races, Top Players: In-depth look at how every conference race in 2017 is expected to unfold, last year’s finishes for each team, what their 2016 NCAA RPI ratings were, projected Pitchers and Players of The Year in each league and a rundown of the top players on each team. • NCAA Div. I Collegiate Baseball Pre-Season All-Americans: 81 first, second and third team pre-season All-Americans are featured heading into 2017 season. • 2017 Draft Preview: Here are the top 57 draft eligible college players in the nation who have a chance of being picked in the first two rounds of next June’s MLB Draft. • NAIA’s Top Players: 2017 Pre-Season All-Americans listed along with Players To Watch at every position. • NAIA Pre-Season Top 25: Top 25 teams in the nation and others receiving votes are listed. In addition, CB does takes an in-depth look at the top 15 NAIA teams in the USA. • NJCAA Div. I Top 20 Poll. Coaches pick top 20 teams going into 2017 season as CB does an in-depth analysis on each of the top 10 teams in the nation. • NJCAA Div. II Top 20: Coaches pick top 20 teams heading into 2017 as CB examines top 5 teams with in-depth analysis. • California Junior College Pre-Season All-Americans: California coaches honor amazing players heading into 2017 season. • Northwest J.C. Top 10: Coaches determine pre-season top 10 teams going into 2017 as CB examines top 5 Northwest JCs. • Baseball’s Unique Tricks Of The Trade: Veteran coaches find numerous ways to help their players reach their potential and beyond. • 2016 National Pitching Coach Of The Year: Oregon’s Jason Dietrich helps numerous pitchers learn precision command. • Lou Pavlovich: Rob Nelson feels it’s time for technology to call strikes in Major League games instead of home plate umpires, and he gives a number of great reasons why. • Editorial: Don’t be a skin cancer death statistic in 2017. • Ron Wolforth: Player pain is an emotional trigger that we play games with. • Unique Acquisition: Georgia State University purchases Turner Field in Atlanta. • Book Review: Heads Up Baseball 2.0 is a remarkable book that all coaches and players will benefit from. • Upcoming Instructional Clinics: Quality clinics are slated across the nation in January. • Ruleball With Rich Marazzi: Infield fly rule has many unique layers. • Passing Of A Legend: Boo Ferriss left amazing legacy as player, coach. 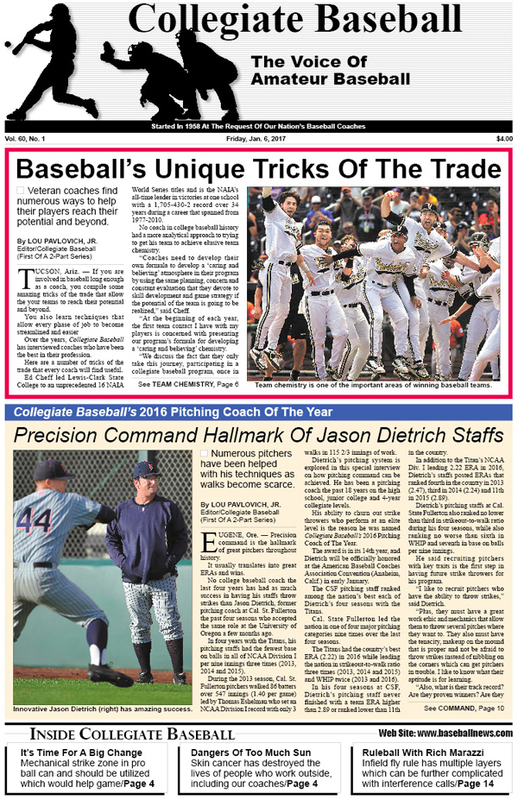 To purchase the Jan. 6, 2017 edition of Collegiate Baseball or subscribe, CLICK HERE.